Normally 4GB kits of DDR2-800MHz prices sit around £45-50. 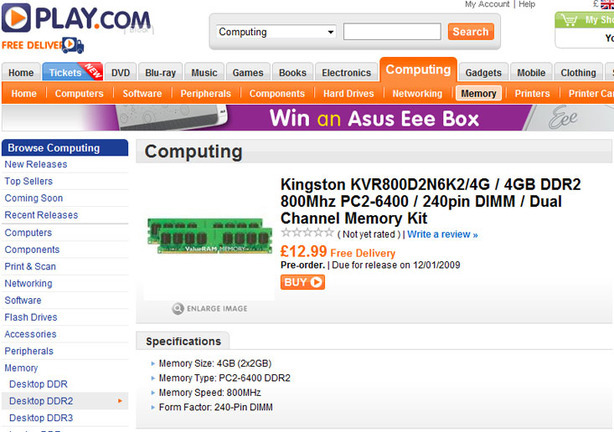 We thought this was cheap, but it turns out Kingston didn't just go one better - they are set to bottom out the value of DDR2 with a kit available for just £12.99 from play.com in the UK. So that includes delivery also. That's an insanely low price and we're wondering how they even make a penny on that?! The downsides (and obviously there will be) is that the KVR800D2N6K2/4G kit is a super slow CAS-6 and forget any frills like heatspreaders - these are naked as the day we were born. But for £13, every family member I know is getting a post-Christmas 4GB upgrade present to keep them ticking over for another year. How will the other memory vendors react to such a sharp drop in price for a very key product? We already know of several online stores who's biggest seller is cheap 4GB DDR2-800 upgrade kits so we expect these to shift like hot cakes on national bun eating day. Fancy a post Christmas update - well get in quick and let us know how you get on, or if you spot any more crazy deals in the forums! Thanks to Azh_fx from our community to pointing this one out - well spotted! Updated: Play.com changed the price sorry!